For those born February 9, 1991. 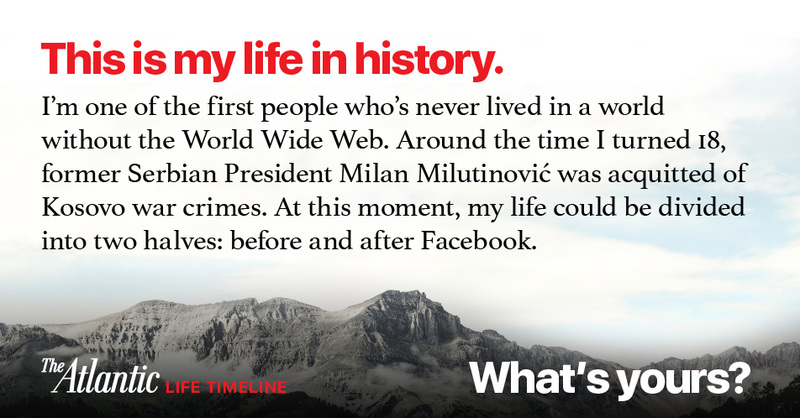 You're one of the first people who's never lived in a world without the World Wide Web. Around the time you were born, President George H.W. Bush announced a ceasefire to end the Gulf War. In January 2016, Alan Tayler published a photo essay marking the 25th anniversary of the Gulf War. You were born in February of 1991. This year, The Atlantic celebrates its 160th birthday, making it 6 times as old as you. The year you were born, Witold Rybczynski wrote about the history of work and leisure time. At 10 years old, you were part of the generation most shaped by 9/11. Your life can be divided into two halves: before and after Facebook. In May 2012, Stephen Marche wrote about how Facebook and other social-media platforms were making people lonely, even as they connected them to others more than ever before. In 2007, Tyler, the Creator, who was born the same year as you, co-founded the alternative hip-hop collective Odd Future. In April 2015, Spencer Kornhaber wrote about why physical albums will never die. Around your 18th birthday, former Serbian President Milan Milutinović was acquitted of Kosovo war crimes. In February 2013, Liam Hoare wrote about how the U.S. and Europe could help secure gains made in Kosovo since the state gained its independence. When you turned 19, you witnessed the revolutionary fervor that transformed the Arab world in 2010, a movement led by your generation. By the time you turn 40, the collective GDP of the four leading developing countries (Brazil, Russia, India, and China) is likely to match that of today's leading Western nations.